Ah, retirement – that wonderful new chapter where the world is your oyster and your days are carefree. 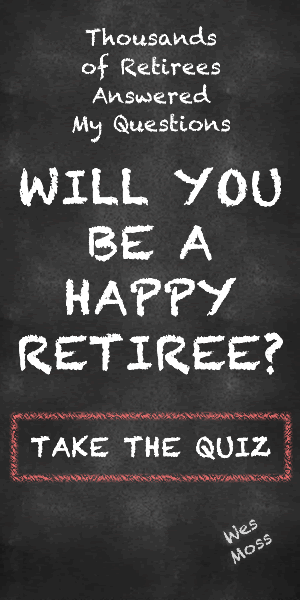 Making the much-coveted transition from worker bee to retiree is full of possibilities. Including the possibility that you and your spouse will drive each other crazy. Let me explain. While you were working, either one or both of you were probably away at work for most of the day. When you reconvened at home in the evenings, you no doubt relaxed and decompressed from the day together. During retirement, that routine changes. Big time. You may find yourself spending the majority of the day with your spouse, and while this is a delightful idea, the reality may be less than perfect. Spending that much time with anyone – even your best friend and life love – can put the relationship to the test. If you stay cooped up in the house together, you may start squabbling more. You could crave more space and privacy without knowing how to get it. And little irritations could balloon into bigger resentments. This, friends, is how marriages can become strained during our golden years of retirement. But why? After all, you now have the freedom to travel at will, to golf all day, to take long afternoon walks, to spend more time with the grandkids, to perfect your English garden. The reason is quite simple: When some people retire, they don’t have a clue as to what they will actually do, day-to-day, to make themselves happy. I’ve written before about the importance of cultivating core pursuits – hobbies and activities you enjoy– during your lifetime, and especially in retirement. In gathering research for my book, You Can Retire Sooner Than You Think, I took a deep-dive into what makes the happiest retirees so darn joyful. I found that core pursuits rank high on the list. According to my research, the happiest retirees have, on average, 3.6 core pursuits. The unhappy retirees have only 1.9. So, the happy folks had identified their particular passions and were actively engaging in them on a regular basis. What’s more is that it doesn’t matter at all what your specific core pursuits are – you could enjoy tutoring, sailing, painting, or taking classes in a foreign language. The key is simply that you have core pursuits, and that you do them. While some people know years before they retire how they want to spend their time during retirement, some people don’t have a solid plan. But it’s essential to have one. And it’s equally important to communicate how you imagine your retirement with your spouse so you’re both on the same page. Start by asking basic questions to spark a conversation about what your shared retirement will look like. Identify your goals, your budget, and your individual and shared core pursuits. As a general rule, women are more likely to have a host of friends and belong to social clubs. If you’re wife to a husband who likes to spend time at home, encourage him to get up and go. It’s good for each spouse and it’s good for the marriage if both of you are engaged in activities that take you out of the house and provide the opportunity to socialize and meet new folks. This doesn’t mean that you don’t spend time with your spouse. Of course, you got married because, among other things, you enjoy each other’s company. What is key, however, is that you each pursue what makes you happy as individuals, while also nurturing what makes you happy as a couple. One of the greatest joys of retirement is the time and freedom you have to pursue the things you love. So, get out there and do them. After all, when else will you be able to golf four or five times a week, tutor kids, travel the world, or get that Ph.D. in French literature? Just make sure that you and your spouse both have core pursuits in place to pursue, and you’ll be basking in both marital harmony and retirement bliss.